Iowa play-by-play announcer Gary Dolphin will be reinstated for Hawkeyes football spring practice and will return to call both football and basketball in the 2019-2020 season. Hawkeye Sports Properties, the multimedia rights manager for University of Iowa Athletics, today announced it will reinstate play-by-play announcer Gary Dolphin beginning with coverage of football spring practice. Dolphin will also return for the 2019-2020 football and men’s basketball seasons. The reinstatement decision was made and announced by Learfield’s Hawkeye Sports Properties after discussions with the Iowa Athletics Department. 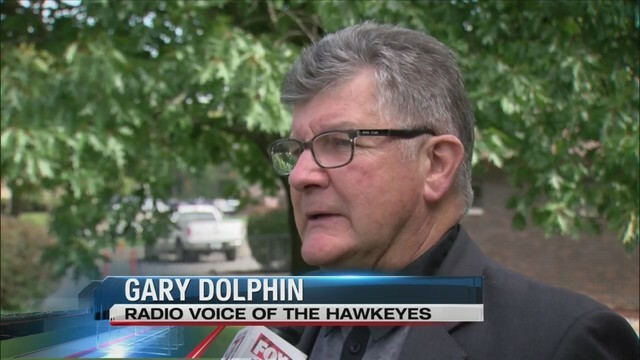 Dolphin, the “Voice of the Hawkeyes” since 1996, was suspended on Friday for the remainder of the men’s basketball season for an inappropriate comment during the February 19 broadcast of the Iowa men’s basketball game against Maryland. Dolphin and Iowa Director of Athletics Gary Barta will participate in a 3 p.m. news conference at Carver-Hawkeye Arena. Iowa's men's basketball play-by-play announcer Gary Dolphin has been suspended indefinitely through the end of the season. Audio of his comment after the Maryland loss was also included in the release: "Fernando was King Kong at the end of the game." The University of Iowa athletics department put out a statement in support of the suspension. "The University of Iowa athletics department supports Hawkeye Sports Properties decision to indefinitely suspend radio play-by-play announcer Gary Dolphin. The University of Iowa athletics department values diversity and is committed to creating a welcoming environment for all members of its campus community." Albracht is the voice of the IFL's Quad-City Steamwheelers, whose first game is 7:05 tonight at the TaxSlayer Center. The Hawkeyes also host Indiana at 8:15 p.m.
Pete Ivanic and Rusty Van Wetzinga will call the game for the Steamwheelers tonight. No one will wear No. 10 again for the Hawkeyes women's basketball team.